But sometimes that's not enough. 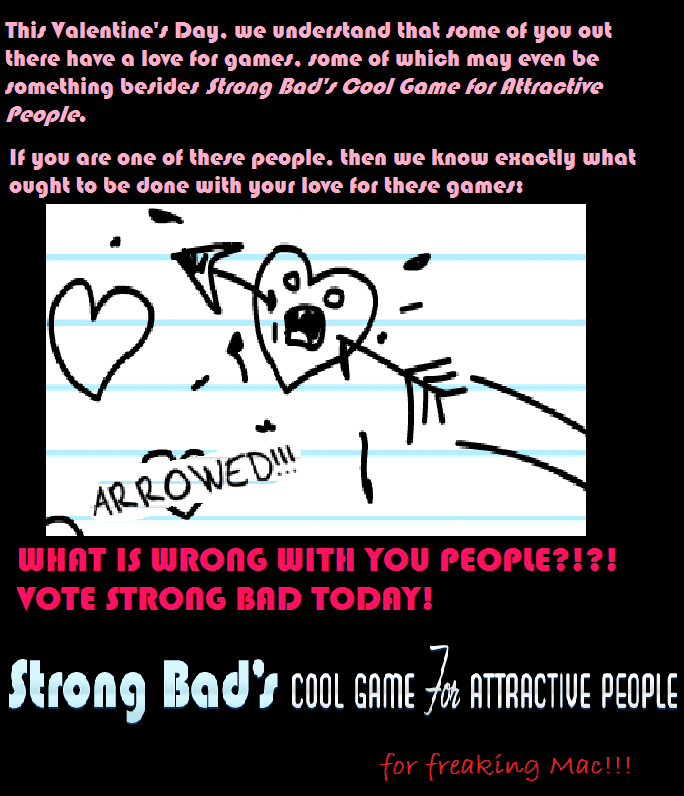 They also want people to make propaganda posters/buttons to raise support for their games. And we've got to do that! Here are the posters I've made so far. Notice the careful mockery of Telltale's other games. So hurry! Make posters! Make buttons! And most of all, VOTE!! Hurry! Voting ends Thursday, February 18th! 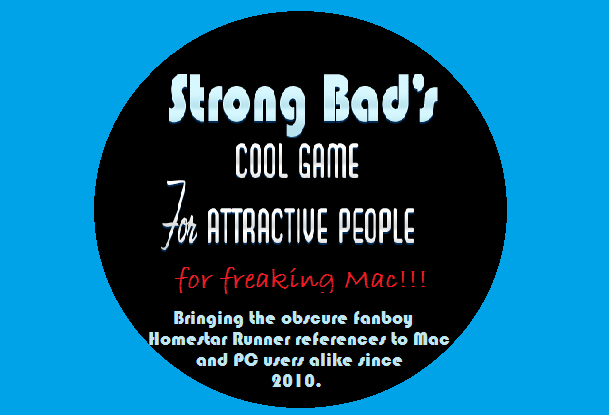 NOTICE: If you do make posters, include the SBCG4AP: For Freaking Mac!!! symbol at the bottom, like I did. Personally, i'm more interested in the Wallace and Gromit game. Swampybutt wrote: Personally, i'm more interested in the Wallace and Gromit game. But seriously, what are you doing here? Maybe you should join some kind of...like...Wallace and Gromit forum. What "joining" the other side? She IS the other side! Finally, why do the game corporations relegate the mac to "For people who think they're smarter than Windows owners?" Then they think we don't deserve games for that very reason. What the crap? 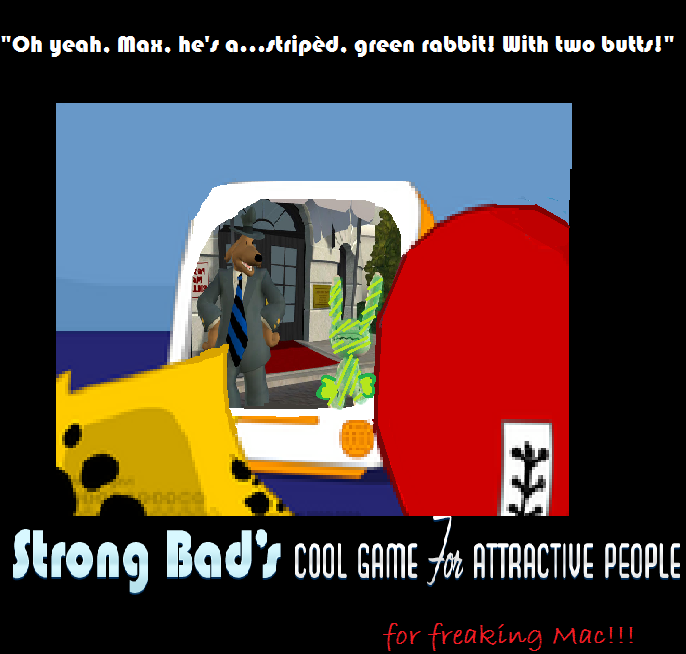 I Personally despise the Mac, but if it means the expansion of SPCG4AP... I'll take one for the team. 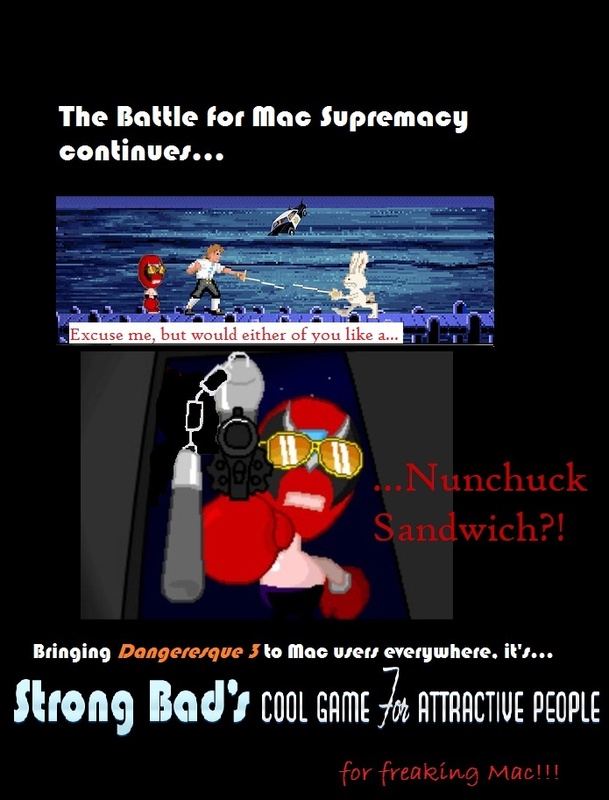 Espemon333 wrote: I Personally despise the Mac. In unrelated news, tyhis belongs in the SBCG4AP forum. 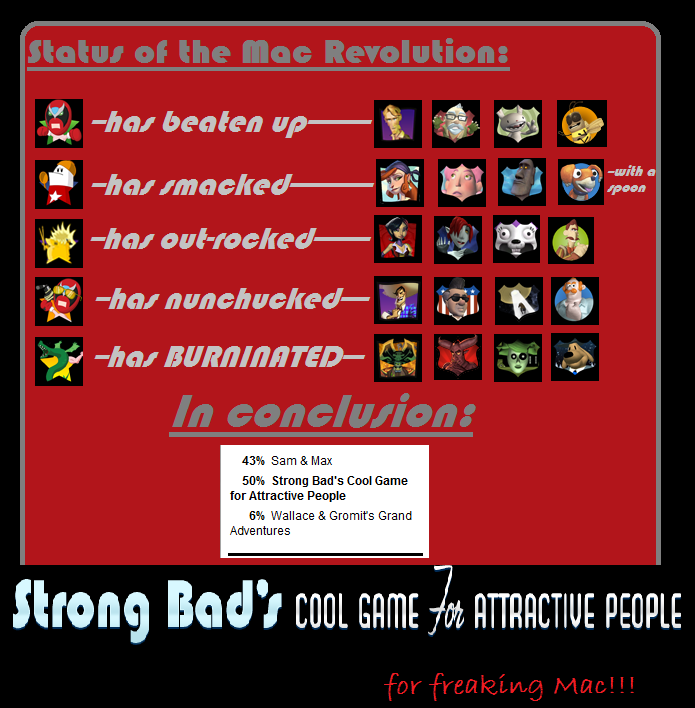 Espemon333 wrote: I Personally despise the Mac, but if it means the expansion of SPCG4AP... I'll take one for the team. What's wrong with the Mac? Do you stereotype us as people who think we're better than you? Or do you just have some unwarranted hate of the hardware. If it's the second one and you don't own a Mac, I believe "Pity" would be better than "Despise." No right click?!?!? That's a deal breaker. Espemon333 wrote: No right click?!?!? That's a deal breaker. Um, my mouse can right click. I mean, the Mac standard from the G4 couldn't, but now it's the G6. It can right click. Plus, even then, third party mouses existed that had right mouse buttons. My Dad really likes the Mac. He has one as a laptop. However, our other three desktop computers are all PCs, and have been for some time. We didn't make the whole transition because...well...all of our games and programs and everything are all on the PC, and wouldn't work on the Mac. But I wanted to say that I do respect the hardware. 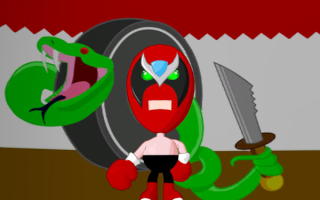 We can't let Strong Bad's considerably-hard-to-handle style down! 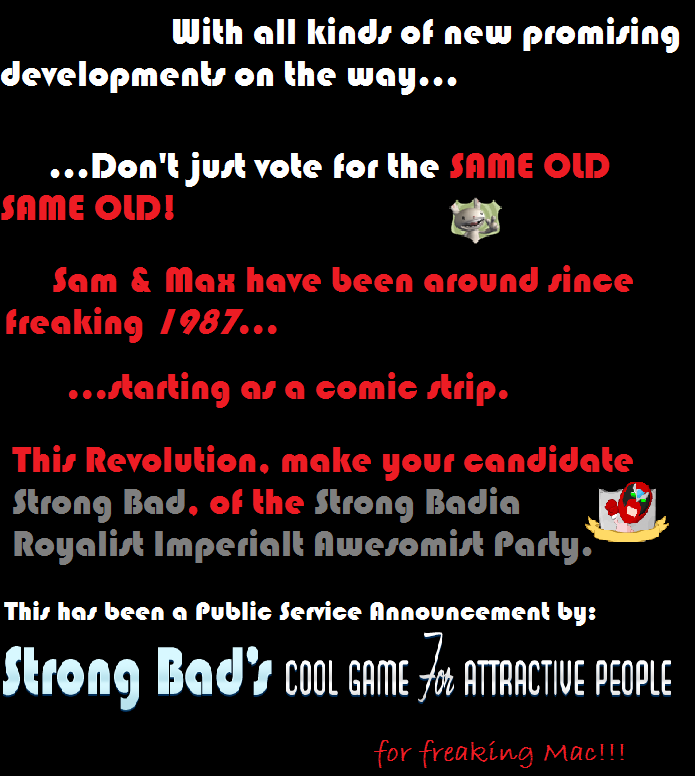 New Poster, slackers! 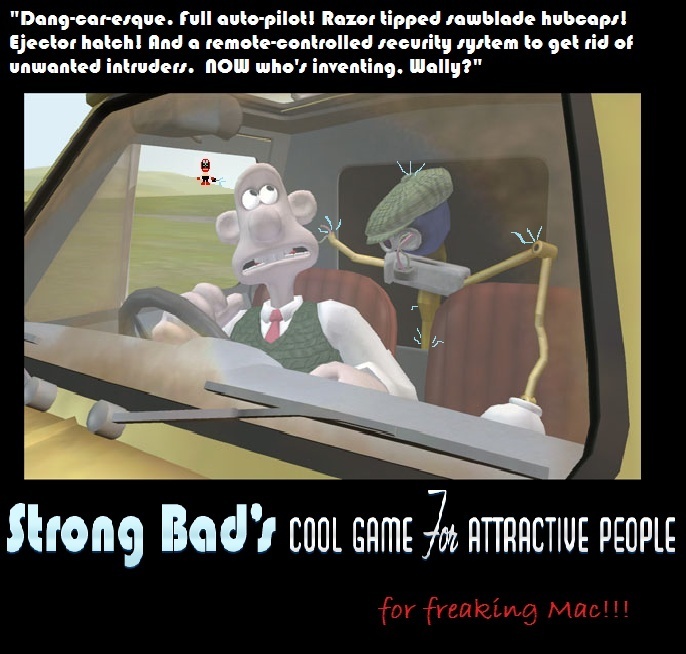 Somebody made a picture of Sam and Max fighting Guybrush Threepwood (http://farm5.static.flickr.com/4033/4354278085_e7ae06c9ab.jpg), so I added a character. Espemon333 wrote: You're good at this. Thank you, I try. Now you guys try, too! That's funny, I can't figure out the Video Production on a PC, Final Cut Pro is just overly good for that stuff. It's all in the eye of the beholder, eh? SBCG4AP on Mac=purchases from those who don't own PCs=revenue for Telltale=second season pick-up for SBCG4AP=happy DELETED. Also...I thought Wallace and Gromit would be doing MUCH better than this. I haven't seen W&G yet, but it's a very popular short film series...so I've heard.